Was her father a criminal mastermind or a victim? In this wonderfully nuanced Victorian-era mystery, Miss Gillian Young is a seamstress, making a living designing and sewing for an aristocratic lady and creating costumes for a London theatre. Her life is disrupted when her policeman father dies under a shroud of suspicion and mystery. Her new neighbor, Viscount Thomas Lockwood, seems a little too interested in the property she has inherited. Meanwhile, the son of her father’s colleague suddenly expresses an interest in Gillian’s hand. As she examines the motives of the two men with seemingly romantic intentions, can she discern which is true and which is opportunistic? Can she clear her father’s good name or was his honor just a sham? Will she survive the cold-blooded machinations of a murderer? A Lady in Disguise has some tense moments as Gillian must contend with threatening messages, lurkers in the shadows, and hoarse whispered threats from outside her door. Evidence disappears, friends become enemies, and justice seems unobtainable. As she questions her father’s integrity, finding he held secrets from her, his coworkers seem convinced that her father lived a duplicitous life marked by bribery and the ill use of innocents. Gillian cannot believe that she didn’t actually know her father. It will take every ounce of wit and wisdom that Gillian has to save those that she loves, in life and beyond the grave. Even as she strives to keep her business afloat and her household intact, she reaches out to the rejected leavings of London’s seasonal pantomime theaters. Despite her own hardships, she works to relieve the hardships of others. Hers is an honorable life lived by example and characterized by honesty and integrity. 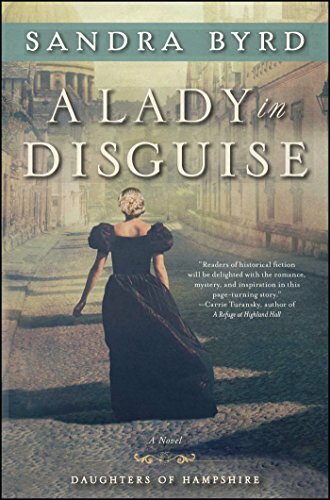 A Lady in Disguise is another wonderful Victorian romance/mystery by Sandra Byrd wrapped around snippets of London’s history, including the use of child labor in the theater and the role of the Salvation Army (rewritten as the Cause). Gillian is a strong female character more than able to stand on her own as she navigates the perilous web of society and class. While Gillian lives by her Christian faith and it is an integral part of the story, Byrd weaves it into the story so tactfully and unobtrusively that it’s pleasing and matches the character, rather than blasting the reader. I am greatly annoyed and quickly discard books where religion and scripture are a disruptive and annoying intrusion slamming the reader about the head, rather than an integral part of a character’s life. Byrd has such a deft touch with Christianity that it is both more believable and integral to the heroine’s character. While there is one character who has an offensive version of Christianity in this novel, it is actually because that person is hypocritical and a criminal, although they are given motivation during the story. The whole Christian element is done with such finesse and that I think even non-believers will find it consistent with the characters, true to the actors’ era, and not “preaching” or in-your-face offensive. Highly recommended for those who enjoy historical, Victorian, or Regency romances, clean romance, gothic novels, skillful mysteries, and nuanced storytelling.